Latimer eighth grade teacher Jeffrey Spafford and Moreland Middle School eighth grade teacher Dawn Lavond have been selected as two of the top ten finalists to receive a California League of Middle Schools (CLMS) Educator of the Year Award, representing Region 5 covering Monterey, San Benito, Santa Clara and Santa Cruz Counties. 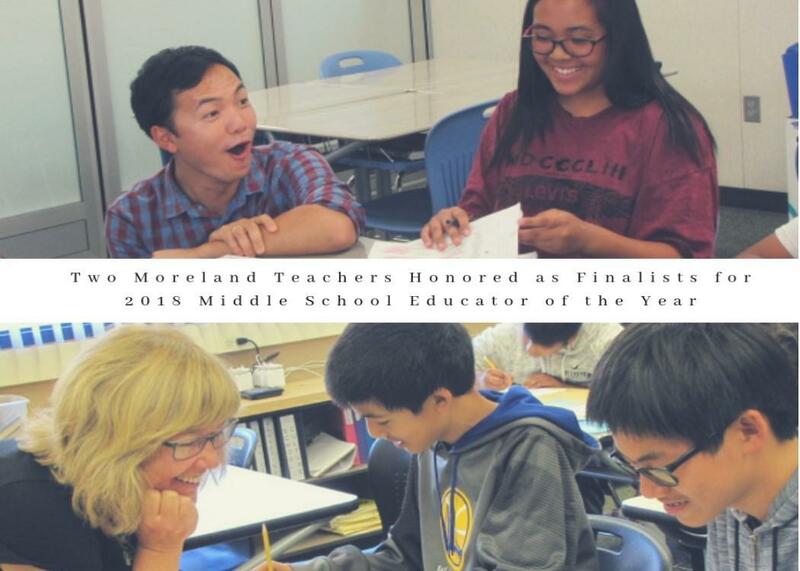 San Jose, November 14, 2018: Moreland School District is proud to announce that Latimer eighth grade teacher Jeffrey Spafford and Moreland Middle School eighth grade teacher Dawn Lavond have been selected as two of the top ten finalists to receive a California League of Middle Schools (CLMS) Educator of the Year Award, representing Region 5 covering Monterey, San Benito, Santa Clara and Santa Cruz Counties. An EdCamp presenter, a certified Google for Education Educator, and a member of the Krause Center for Education Merit 17 cohort, Jeff works tirelessly to make Latimer’s middle school an enriching and positive school climate not only for students, but for middle school families and his colleagues. Jeff’s classroom lessons tackle current events that lead to topical conversations, forcing students to look at their own personal influences and biases, while giving them opportunities to self-manage their own academic path. As Latimer transitioned to a full K-8 school, Jeff was instrumental in shaping the middle school culture by being an advisor for extracurricular programs such as Latimer Leaders (middle school government) and California Junior Scholarship Federation (CJSF) recognizing and encouraging student achievement and community service among middle school students. Described by her colleagues as innovative and dedicated, Dawn Lavond’s lessons come alive for her students at Moreland Middle School. From analyzing the famous Cabinet Battle rap song in the Broadway production of Hamilton, to role playing the civil war, and debating articles in the Constitution, Dawn encourages her students to take risks and discover a lifelong love of history. With a focus on connecting to students, Dawn teaches Leadership at MMS, where she has created lessons that push students to develop civically, develop self-awareness, and promote community service. Students are encouraged to develop their skills in leadership through event planning, leadership activities, and more. A life-long learner herself who is always willing to go above and beyond, Dawn was most recently selected to join the Museum of Tolerance in Los Angeles to help create curriculum for classroom use as part of their Teaching Tolerance program. The California League of Middle Schools “Educator of the Year” honors middle school educators representing regions throughout California who exemplify educational excellence and have made a significant effort to implement elements of educational reform in middle schools. One finalist will be chosen to represent Region 5 at the CLMS Region 5 Award Ceremony on Thursday, November 29, 2018, and participate in the statewide recognition at the CLMS Annual Conference in March in Sacramento, California.